If you had told my younger self that I'd be wearing pink when I got older I would let out a loud laugh and tell you there is no chance in hell that would happen. 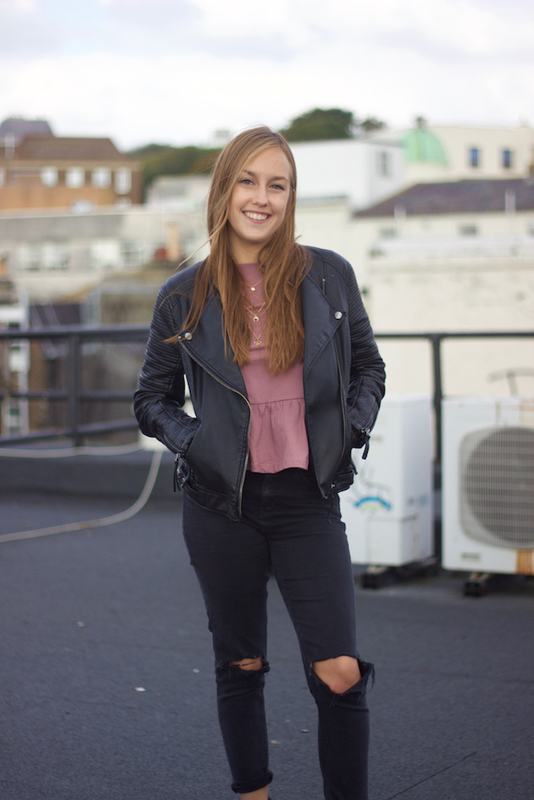 I used to be a right tom boy, so although I've allowed pink into my life I could not wear it in a girly way and so I wanted to add a bit of an 'edge' with ripped jeans, leather jacket and boots and I think I managed to create what I think could be one of my favourite outfits for Autumn. 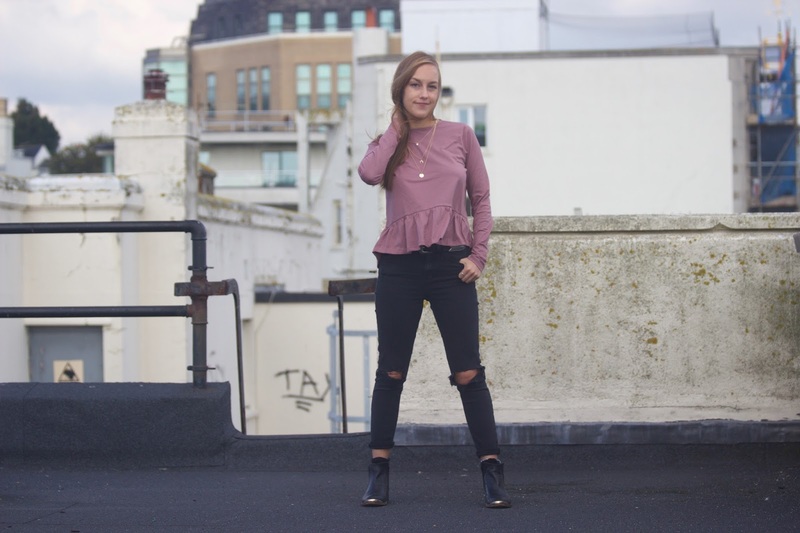 I was scouring ASOS like we all do and was determined to find some tops as you know how we all go through that phase of hating our wardrobes and so I wanted something that had a little more flare than your bog standard t-shirt. 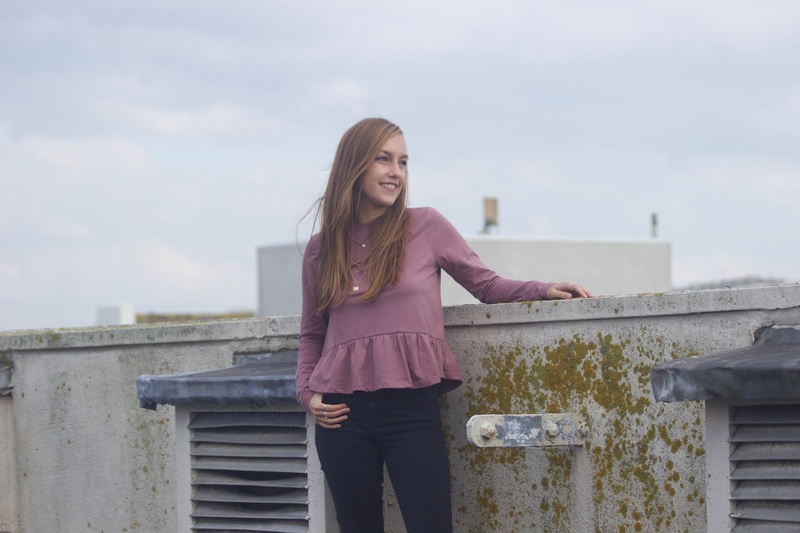 I saw thrifts and threads post a top on instagram with a ruffle hem and came upon this top which I knew I had to have, it even has an open back so I know I could easily dress it up for night time and plus who says pink has to stay in spring/summer. 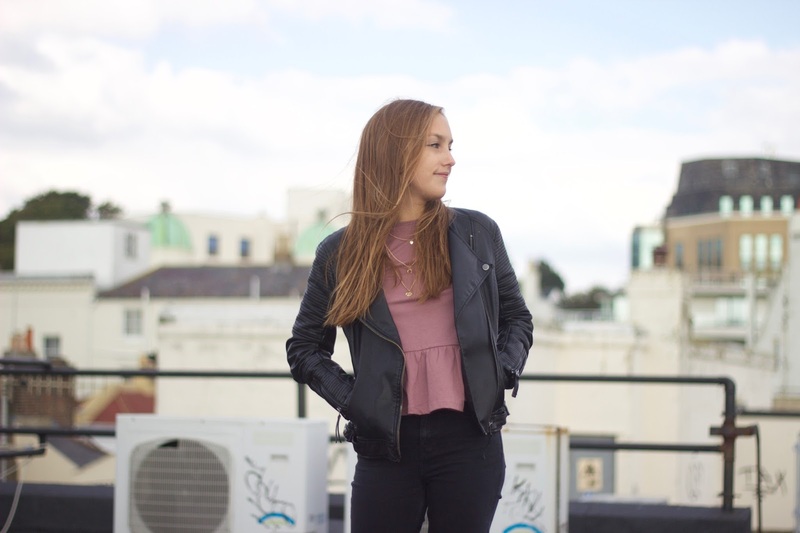 I was lucky enough to have an old blogging friend Saffy to take these new photos, she showed me a super cool location on top of a roof (which I did feel a little rebellious about doing) and then after we went to warm up with hot chocolates in a cute cafe which you will all see in a series of posts I'm working on. I cannot explain how happy it makes me that I can work on posts in Brighton and get to come home from University every day. I know that after these short few weeks back at University and commuting to London was one of the best decisions I've ever made, I can see how much happier I am being able to come home and see my friends and boyfriend as much as I want, home is just the place for me. University life isn't for everyone and you should never feel ashamed to admit if you haven't enjoyed it like everyone else. I hope you've all had a lovely relaxing weekend, whatever you got up to and you feel refreshed and ready for the week ahead! Aww love this look! I love this top id defo get it maybe a bit diff colour. My whole back is tattooed so it would look cute ! Btw ur smile is cute!! See you soon, Kisses from London! Dominica.